New Delhi, Mar 16 (PTI) Seeking to promote helicopter-tourism, Indian Railway Catering and Tourism Corporation andPawan Hans have joined hands under an agreement that wouldallow flyers to book tickets through IRCTC website. Pawan Hans is a PSU of the Civil Aviation Ministry. TheMemorandum of Understanding has been signed to implement the'heli project' by making joint use of their capabilities andfacilities to give a major fillip to tourism initiatives bythe IRCTC, a railways PSU. The agreement envisages both sides to jointly identifyareas of cooperation and draw up detailed projects topromote 'heli tourism' in the country and enable selling ofonline tickets for regular and chartered helicopter servicesand joy rides. "The signing of MoU with Pawan Hans will give a majorpush to our tourism initiatives by promoting 'heli tourism' inthe country, an area which has enormous potential as a touristproduct," IRCTC's Chairman and Managing Director A K Manochatold PTI. The two sides will also facilitate marketing orcross-selling of products and services through both physicaloutlets and websites, thus improving the range of services totheir own customers. Both will also undertake opening and managing of variouscatering and hospitality outlets and budget hotels throughtheir joint strength, at Pawan Hans (PH) properties and non-PHlocations. 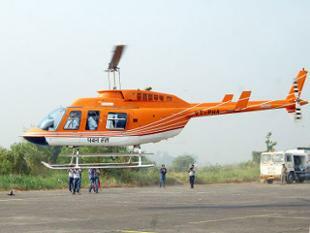 IRCTC has already been providing helicopter rides totourists for an aerial view of Mumbai. "The MoU will give acutting edge to such an effort," Manocha said. Founded in 1985, Pawan Hans has been mandated to providehelicopter service to oil companies and has also been workingon the development of 'heli tourism' sector through a widenetwork of offices and facilities across the country.